FRA’s Toby Duthie and Derek Patterson received the highest number of nominations from peers, corporate counsel and other sources for Who’s Who Legal (WWL) Investigations Forensic Accountants 2018 and are listed as Thought Leaders in EMEA. 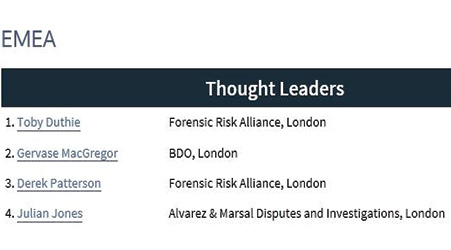 London-based consultancy firm Forensic Risk Alliance is home to two of the highest rated forensic accountants identified by our research. Toby Duthie is “a highly articulate financial expert” according to sources, who praise his “ability to communicate complex issues clearly and come up with creative solutions”. Derek Patterson is a prominent name in the market who is recommended for his “excellent analysis and superb delivery of expert witness testimony”. One commentator effuses: “He is always completely reliable, even in difficult situations.” The “outstanding” Frances McLeod is a highly respected expert who sources describe as “a pleasure to work with”, adding that she is “excellent with clients”. See the full list of experts from around the globe in WWL.